Our Featured Artist for the month is Jihoon Shin, recent Masters of Music graduate from the Yale School of Music. Jihoon is the first prize winner of the NFA Young Artist Competition in 2011 and has won first prizes in the Friedrich Kuhlau International flute competition and Volos Flute meeting International competition in 2005 and 2006, respectively. She was also an award winner at the 7th Kobe International flute competition in 2005 and the Jean-Pierre Rampal International flute competition in 2008. As an international solo artist, Ms. Shin has performed with the Wonju Philharmonic Orchestra, Madri Chamber Ensemble, and Volgograd Soloists Orchestra. In addition, Ms. Shin has performed numerous recitals throughout South Korea, Europe, and the United States. Jihoon’s principal teachers include SoYoung Lee, Karl-Heinz Schuetz, Jean-Claude Gerard, and Ransom Wilson. We had the opportunity to ask Jihoon a few questions. Check out her thoughts on how studying music differs from Europe to the U.S., preparing for a competition as well as advice for upcoming flutists. 1. As the winner of the 2011 NFA Young Artist Competition as well as the Friedrich Kuhlau International Flute Competition (2005) and Volos Flute Meeting International Competition (2006), how did you go about preparing for the competition? Instead of working on the same program for months, I have more of a tendency to prepare my program from a month before the competition. Of course I learn the music beforehand but the last month into the competition is definitely my concentrated working time on the program. During this period, I concentrate more on my collected musical ideas and details, ensemble with the pianist and my sound quality. I think it helps me to keep up with my enthusiasm of the program, because when I work on the same program over and over again for several months, by the time I have to play in the competition, I lose my intensity and excitement of the pieces. 2. How is this preparation and performance experience different from a solo recital? When I was young, I had so much pressure on the competitions. I often was not able to concentrate fully with my music in the competitions because it made me so nervous just the fact that my playing was being ‘judged’ by other people with actual score. But the more competitions I do, I found out that it is not really different than the solo recitals. I would prepare my best for both occasions, and I would try to play my best for both as well. At some point, competitions started to feel like another solo recital for me. Then I was able to relax more in the competitions and actually enjoyed them! 3. What did you perform on your final program and how did you go about choosing the repertoire? In my final program, I played A.Jolivet – Chant de Linos, P.Taffanel – Grande fantasie sur Mignon for flute and piano and W.A.Mozart – Andante in C major K.315. The reason why I picked these pieces is that I wanted to show the audience as much character as I could. I thought this would be the nice combination of aggressiveness, virtuoso and simple. And as you can see, it is quite a long program for the final. I thought I was allowed to play 35 minutes in the final, which was my mistake, but I was allowed to play only 25 minutes instead of 35 minutes, and I found this out the day before the final. Virginia told me I can only play 25 minutes, and according to the competition rules, I ‘have to’ play the whole program I turned in. So there was no way for me to take one piece out of my program. I was literally panicking and tried to find a solution. Otherwise I would have been disqualified from the competition, and I would have been very upset. So, I came up with this idea of cutting some parts from each piece. So, I cut some of slow part from Chant de Linos, and I cut a lot of piano parts from the Mignon Fantasie, and I wouldn’t have been able to finish my Mozart anyways, so I didn’t bother cutting parts on Mozart. Virginia told me, there will be time cut when I reach 25 minutes of performance, and as long as I ‘get’ to play the Mozart, I would not be disqualified. So my goal was to reach the point where I can at least play the first line of Mozart so that I wouldn’t be disqualified. And when I was half way through Mozart, the clock went off. I was so relieved and happy. 4. How does the approach to studying music differ from Europe to the U.S.? I think this is a very hard question….. haha.. But since I studied in Europe when I was young, I think my teachers wanted to train my basic skills of flute playing, such as, scales, articulations, sonorite,, etc. Once my basic was somewhat set, they started to improve my musical expression…. But in US, I was able to learn more about stage presence or appearance. 5. What are some of the most important lessons you have learned from your teachers? Every teacher gave me such an important lesson. Not only playing wise, but also as a person. My first teacher Soyoung Lee always told me to be an artist, instead of just a flute player. She took me to a lot of museums, exhibitions, she would often recommend me a whole bunch of books to read, music to listen, then in the lesson, we would just talk about the book that I just read, or the music I heard in the past week. She wasn’t only a flute teacher to me. She taught me the basic mind as an artist and as a musician. Then my second teacher Karl-Heinz Schuetz, who now became the principal flute player at Vienna Philharmonic, would always tell me to put as much as imagination and stories in my music. Once in his lesson, he showed me a lot of different postcards that he had in his studio, and told me to match the postcard picture and the music that I was playing. I think I was learning Dutilleux Sonatine. He picked Monet’s waterlilies postcard, and told me his ideas about Dutilleux Sonatine. Professor Jean-Claude Gerard, who I studied with in Stuttgart Musikhochschule for 4 years, would not let me play any actual piece in my first semester. The only thing I was allowed to do in his class was all different kinds of scales, sonorite, and etudes. After my first year, there was an exam for basic skills, and I got the highest score in the history! After that exam, he trained me as a professional flute player. Mostly, he taught me how to read the music, how to approach to a new music that I have never learned. Because of his lessons, I was not afraid anymore to learn new music all by myself. I could have more faith and confidence with myself, my music and playing because of his guidance. Ransom Wilson, gave me a whole new idea of articulations and color of the sound. In every lesson, just one simple question that he asked me such as “Don’t you think sometimes your sound color stays the same?” or “I think you can play more with your colors and articulations”. Sometimes, that was just enough to make me think what I should do. Then the next lesson he would tell me all different types of tonguing I could use or air directions. 6. 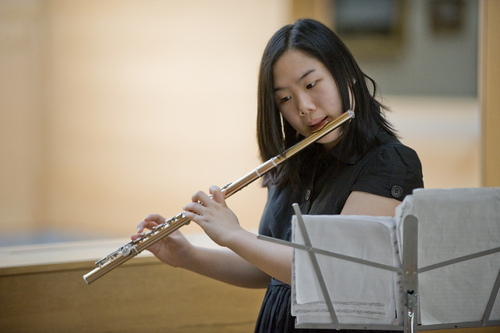 If you had one piece of advice to give an upcoming flutist, what would you tell them? Haha… I am not sure if I am in a position where I can give someone an advice, but I would like to tell them collect as much as emotions, stories and imaginations in their lives. It will eventually become useful for their music. I don’t want them to just stay in the practice room and practice all day.